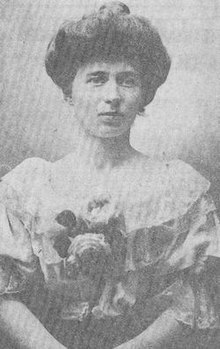 Louise Marie Jeanne Henriette de Bettignies (15 July 1880 - 27 September 1918) was a French secret agent who spied on the Germans for the British during World War I using the pseudonym of Alice Dubois. Traces of the Bettignies family date back to 1228. The Lordship of Bettignies was located near the city of Mons in what is now Belgium. There are further traces of the family in 1507. Peterinck de La Gohelle, de Bettignies’ great-grandfather, originated in Lille. He settled in Tournai in 1752, where he founded a factory creating porcelain art on the quai des Salines. This factory was called the imperial and royal factory. In 1787 the Duke of Orleans ordered a magnificent service in blue decor from Tournai, of which some pieces are held in the Musée royal de Mariemont. In 1818 Maximilen Joseph de Bettignies, advocate to the council of Tournai, General Counsel and magistrate, opened a depot at rue du Wacq in Saint-Amand-les-Eaux, which he gave to his son Maximilian. On 31 July 1818 M.J. de Bettignies filed a patent No. 521 on the paste with which to make large vases of bone china (Brev. d'inv., volume XVI, p. 276). Tariffs were high, and the deposit became factory, after taken over supply of material for the porcelain maker Fauquez, which he improved. First installed in rue Marion, in 1837 the factory was established at a place called Le Moulin des Loups, on the road to Valenciennes. In 1831, Maximilian Joseph obtained French nationality. In 1833 he married, in Orchies, Adeline Armande Bocquet, who bore him four children, one of whom was Henri, Louise de Bettignies’ father. In 1866 Henri de Bettignies married Julienne Mabille de Poncheville, from an old family of lawyers in the north of France. The Mabille family had its origins in the Pas-de-Calais at that time, and for several generations they were notaries in Valenciennes. She was six years older than me. I saw her most often at Valenciennes, at the house of our common grandmother, [...] Louise was blonde, frail in appearance, with a mobile face and piercing eyes that seemed to dart in all directions ... It is true that the days when I saw her, when she was about twelve, were her holidays. She was a boarder with her sister, Germaine, at the Convent of the Holy Union of the Sacred Hearts, where the good nuns fed that lively child opinions that were similar to those of her grandmother. However, she worked so as to give them satisfaction. ... I still have vivid memories of my cousin from the time we spent at our grandmother's house on rue Capron Street, in Valenciennes ... Louise was then twelve. We were both students of the Dames de la Sainte-Union, she as a boarder and me as a day pupil. She already showed a strong character, playful ... Yes, Louise was very nice, very intelligent and showed a lot of personality. " Her parents moved in Lille in 1895, but she left in 1898 for England to continue her higher studies with the Ursulines at Upton, Essex, and then with the Ursulines at Wimbledon and Oxford. After the death of her father in 1903 she returned to Lille, where she graduated in the Faculty of Letters of the University of Lille in 1906. After her studies she had a perfect mastery of the English language and a good knowledge of German and Italian. She worked as a tutor in Pierrefonds, Oise, then went to Milan in Italy, to the home of Giuseppe Visconti de Modrone. In 1906, when she was with the Viscontis, she traveled extensively throughout Italy. In 1911, she went to the Count Mikiewsky,[b] near Lemberg, in Galicia. From 1911 to 1912, she was with Prince Carl Schwarzenberg, at the Orlík Castle. She then moved to the Princess Elvira of Bavaria, at the Holeschau Castle in Austro-Hungary (now Moravia, The Czech Republic). She would have met Rupprecht of Bavaria, whom she crossed in her pérégination of 1915. It was there that she was offered the position of tutor of the children of Ferdinand Joseph, heir to the Austrian throne. She declined the offer and returned to France. Back to Lille at the beginning of 1914, where she was operated on for appendicitis, she went to her brother's home at Bully-les-Mines. At the outbreak of war, Louise was quartered in a villa at Wissant rented by her brother Albert. Before August was over, Louise left Wissant and returned to Saint-Omer. From there, she took the pretext of joining her sister Germaine, whose husband, Maurice Houzet was mobilized, to go to Lille. On 1 August 1914, Adolphe Messimy, Minister of War, suppressed, with the approval of René Viviani, President of the Council, the position of governor of Lille. He had exceeded his rights, as the decommissioning should have been enacted by law. Lille was then declared an "open city" (its fortifications were decommissioned in 1910) and the staff was evacuated on 24 August. On 22 August, after German patrols were seen in the vicinity of Lille, General Percin installed a 75 mm gun in front of each drawbridge of the Citadel. This initiative provoked the wrath of Charles Delesalle, the mayor, and of advocates of non-defense. Faced with this, Pervin retreated. Behind the back of the prefect, the supporters of non-defense created new initiatives to disarm the city. On August 24, the Staff evacuated Lille. During this turbulent period, the government yielded to fear. The prefect Felix Trepont was ordered to retreat with the administrative and postal services to Dunkirk. Then a few days later, he was given a counter-order. Upon his return, the prefect found the offices of military buildings open to all the winds and the equipment abandoned. On 27 August Trepont asked John Vandenbosch, an industrialist, to move all military equipment to Dunkirk. Transport lasted for 21 days, and 278 trains were needed. On 2 September, the Germans entered the city, then departed after extorting ransom. They returned several times. On 4 October, a detachment of Wahnschaffe stumbled on a battalion of Chasseurs on foot, resting in the city. Taken aback, they retreated, burning some houses in the suburb of Fives. Lille was invaded by a crowd of refugees. Until October 9, there was confusion in both prefecture and in the city. On October 9, the commander Felix de Pardieu and his territorials were ordered to retreat in the region of Neuve-Chapelle, leaving Lille without defender. General Ferdinand Foch, who arrived on the night of 4 to 5 October, warned by the prefect, sent commander Pardieu back towards Lille under the protection of the 20th Regiment of mounted chasseurs. Delayed by the crowd, the ammunition convoy was attacked by a detachment of General Georg von der Marwitz. Tired of waiting for the start of the British offensive, Foch dispatched the cavalry corps of commander Conneau to Lille. On the stroke of noon on 12 October, Lille heard the gunfire coming closer. The corps of Conneau engaged in a famous battle, but did not persist, believing that Lille had succumbed. Surrounding the city, the Germans had between 50,000 and 80,000 men, facing a motley band of 2,795 men composed of chasseurs, goumiers and especially territorials, armed with a battery of artillery, with three 75mm guns and little ammunition. Louise and Germaine lived together at 166 rue d'Isly. From 4 to 13 October 1914, by turning the only cannon that the Lille troops had, the defenders succeeded in deceiving the enemy and holding them for several days under an intense battle that destroyed more than 2,200 buildings and houses, particularly in the area of the station. Louise de Bettignies, aged 28, spoke four languages including German and English. Through the ruins of Lille, she ensured the supply of ammunition and food to the soldiers who were still firing on the attackers. In makeshift hospitals, she wrote letters in German dictated by dying Germans to their families. De Bettignies had been a citizen of Lille since 1903, and when the German army invaded the city in October 1914, she decided to engage in resistance and espionage. Due in part to her ability to speak French, English, German, and Italian, she ran a vast intelligence network from her home in the North of France on behalf of the British army and the MI6 intelligence service under the pseudonym Alice Dubois. This network provided important information to the British through occupied Belgium and the Netherlands. The network is estimated to have saved the lives of more than a thousand British soldiers during the 9 months of full operation from January to September 1915. The "Alice" network of a hundred people, mostly in forty kilometers of the front to the west and east of Lille, was so effective that she was nicknamed by her English superiors "the queen of spies". She smuggled men to England, provided valuable information to the Intelligence Service, and prepared for her superiors in London a grid map of the region around Lille. When the German army installed a new battery of artillery, even camouflaged, this position was bombed by the Royal Flying Corps within eight days. Another opportunity allowed her to report the date and time of passage of the imperial train carrying the Kaiser on a secret visit to the front at Lille. During the approach to Lille, two British aircraft bombed the train and emerged, but missed their target. The German command did not understand the unique situation of these forty kilometers of "cursed" front (held by the British) out of nearly seven hundred miles of front. One of her last messages announced the preparation of a massive German attack on Verdun in early 1916. The information was relayed to the French commander who refused to believe it. Arrested by the Germans on 20 October 1915 near Tournai, she was sentenced to forced labor for life on 16 March 1916 in Brussels. After being held for three years, she died on 27 September 1918 as a result of pleural abscesses poorly operated upon at St. Mary's Hospital in Cologne. Her body was repatriated on 21 February 1920. On 16 March 1920 a funeral was held in Lille in which she was posthumously awarded the Cross of the Legion of Honor, the Croix de guerre 1914-1918 with palm, and the British Military Medal, and she was made an Officer of the Order of the British Empire. Her body is buried in the cemetery of Saint-Amand-les-Eaux. A small museum is located in the birthplace of Louise de Bettignies, rue Louise Bettignies (formerly Rue de Conde) in Saint-Amand-les-Eaux, since 2008. Several French towns have given her name to streets, schools and other structures. Among others, the school where Françoise Sagan studied (and was expelled from) was named for Louise de Bettignies. De Bettignies is a secondary character in Kate Quinn's book "The Alice Network", published in 2017. Wikimedia Commons has media related to Louise de Bettignies. ^ According to Louise's niece Marguerite de Bettignies, "They were too artistic, too proud to claim their due, for the "big people" of the world were failing to pay their bills, convinced no doubt that for them to order, and thus to recognize the talent of the Bettignies, was a distinction worth all the gold in the world. When the situation proved untenable, they preferred to put the key in the door, rather than letting their workers go unpaid. ^ According to note 16 on page 29 of the book by René Deruyk, she was related to Adam Mickiewicz (1798-1855). ^ Alison Fell (27 October 2014). "Viewpoint: Why are so few WW1 heroines remembered?". BBC News. Retrieved 27 October 2014. ^ Deruyk 1998, pp. 7-8. ^ Deruyk 1998, p. 9. ^ Deruyk 1998, pp. 11-12. ^ a b c Bettignies 2008. ^ André Mabille: Voix du Nord. ^ Madame Delcourt: Voix du Nord. ^ Deruyk 1998, p. 17. ^ Deruyk 1998, p. 29. ^ Redier 1924, p. 12. ^ Deruyk 1998, p. 31. ^ Alice: Pays du Nord, p. 27. "Alice". Pays du Nord (84). June – July 2008. "André Mabille de Poncheville (23 May 1886 - 20 May 1969)". La Voix du Nord. 30 September 1967. Bettignies, Bertin de (13 August 2008). "De Bettignies Louise (1880 - 1918)". Retrieved 27 June 2013. Deruyk, René (1998). Louise de Bettignies: résistante lilloise (1880-1918). la Voix du Nord. ISBN 978-2-84393-007-2. Retrieved 27 June 2013. "Madame Delcourt, née Laure Marie Mabille de Poncheville(1882-1977)". La Voix du Nord. 28 September 1968. Hélène d’Argœuvres, Louise de Bettignies, Plon, 1937 et La Colombe, 1956. Gem Moriaud, Louise de Bettignies, ed.Taillendier, 1928. Louise de Bettignies sur le site officiel chemins de mémoire. Louise de Bettignies sur le site officiel Chemins de mémoire de la Grande guerre en Nord-Pas de Calais. Monument en l’honneur de Louise de Bettignies. Louise de Bettignies, avec arbre généalogique. De Bettignies Louise (1880 - 1918) écrit par Bertin de Bettignies, petit fils d'Albert de Bettignies, frère de Louise de Bettignies. Antier, Chantal: Bettignies, Louise Marie Jeanne Henriette de, in: 1914-1918-online. International Encyclopedia of the First World War.